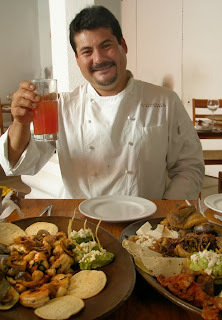 You can’t utter the words “Oaxaca” and “food” without including Alejandro Ruiz, who runs the kitchen at Casa Oaxaca, an elegant hotel and restaurant in the colonial centro. The affable Ruiz, 34, is the most talked-about chef in town. Growing up in La Raya de Zimatlán, a village outside Oaxaca, he learned to cook from his mother and grandmother. A sense of that fresh, earthy, attentively prepared home cooking is evident even in his flashier dishes – his food is innovative without losing sight of tradition. Naturally, I jumped at an invitation to go shopping with Ruiz in the sprawling Mercado de Abastos on the edge of town. The Mercado is enormous, covering many square blocks, and has a rambling, improvised air about it. 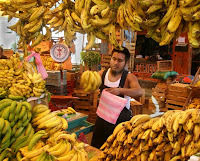 It attracts people from nearby indigenous communities; many dressed in traditional clothing, who arrive by bus, burro or foot to peddle their wares in the daily market. An old-fashioned “el México que se nos fue” ambiance pervades. Little has changed here in recent decades; it’s still one of Mexico’s most important markets. As you wander down aisle after aisle, a barrage of aromas and colors fills your senses. Regional fruits and vegetables are available, as are live goats, hens and turkeys. Handmade leather saddles and forged iron tools, traditional embroidered clothing, and a plethora of copper-green glazed ceramics are all on sale. Locals and tourists alike wander the dusty aisles in search of necessities, bargains, or both. Ruiz has shopped here since childhood and knows the names of many vendors, who come from the surrounding countryside to sell their unusual produce: flor de frijol (crimson red bean flowers), hierba de conejo (a pungent herb used for soup), and frijolón (extra large chocolate colored beans) were among the things I'd never seen before. 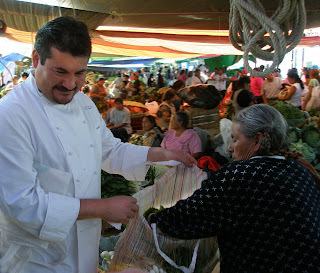 "Look, Doña Juana has huitlacoche – out of season!" Ruiz exclaimed at one stall, pointing to a mass of purple-black corn fungus that is prized for soups and quesadillas. He shopped quickly but carefully, checking the quality of each herb or vegetable, not working from a shopping list, but observing what was freshest in the market, and inventing his menu as he went along. I left content to know that later that day I would be seeing the booty refashioned as great food. Later that afternoon, at a leisurely comida at Ruiz’ Casa Oaxaca restaurant, I was treated to creative concoctions such as tacos of thinly sliced sweet and cool jicama filled with crunchy salty chapulines (crickets), or the chiles rellenos de mariscos (seafood-stuffed chilies) on a bed of maracuyá, a tropical fruit that looks like giant caviar with a tangy, citrus-like taste. Perfectly cooked Shrimp, tossed with chili, garlic and a touch of the spearmint-like hoja santa, was a beautifully balanced dish, tangy, tart and aromatic. Desserts, mostly created from local fruits, were unusual but tempting nonetheless: a rich, moist pastel de chico zapote brought out the brown sugary taste of that unusual fruit. The lemonade was perfect, not too sweet. Ruiz looked on, lazily munching on a carrot stick as dish after dish was brought out. Filled to capacity, I politely inquired if he was going to eat; “no”, he replied, “I’m not hungry”. Casa Oaxaca (www.casaoaxaca.com.mx) has two central locations, Garcia Vigil 407 (tel. 52-01-951-514-4173) and Constitución 104-A (tel. 52-01-951-516-8889). From the email of a friend working in Haiti: "I can suggest you donate (to The Haiti Clinic) which serves the poorest of the poor in the worst section of Port au Prince via an existing building that by some incredible stroke of luck was not demolished in the earthquake. However, the prison gangs are now in control of ...that part of the city and the patients are afraid to come into the clinic. For this reason, Haiti Clinic is now trying to raise money to purchase and furnish a mobile clinic (i.e., on a truck) to travel to the people - especially the many regions that have yet to obtain any medical care whatsoever. I can vouch that the money will be put to the best possible use... NO skimming from donations, no administrative costs etc. 100% of the money is used for purchasing supplies.